The Rottweiler is a Strong, Muscular, and powerful dog breeds. They is loyal and protective, devoted to their master and family. 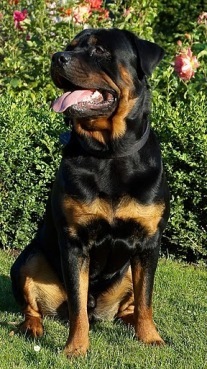 The Rottweiler originates from Germany and is descended from Italian Mastiff. They were used to herd livestock, as a guard, draught dogs. They are also used in search and rescue,as a police dogs. They have nearly extinct in the 1800's, but the breed population make a come back at the early 22 century, by the effort of breeders in Stuttgart. They gets his name from the town of Rottweil in Germany. The breed was recognized by the AKC in 1931. The Rottweiler is a strong dog, with a muscular and powerful body. They is a large dog breeds. The coat is short, straight and coarse to the touch. The color is always black with mahogany or tan markings. They is heavy shedding depend on the seasons. These breeds is powerful, serious, calm and confident. They are very loyal and protective toward their master and master family, they do well in a family environment. Rottweiler is a fast learner,intelligent and responsible. Training should start from young age, and should attend a training class emphasizes socialization and obedience training. Should let them meet many different of people. They should teach obedience commands and household rules, they needs a firm discipline and consistnt training. Grooming these breeds of dogs is not difficult, is relatively easy to groom. The medium-length coat can be brushed twice weekly with a pin brush or slicker brush. Bathing should not too often, because it will remove the natural oils from the coat and skin. Rottweilers are devoted and very loyal to their families. They is powerful, calm, courages and is high intelligent. They should have a large sized yard, they need plenty of exercise. These breed is not friendly to the stranger, and also strange dogs, this is not a dog park breed.